What a massive month May is shaping up to be! The boyfriend and I kicked it off with a weekend trip to the Grampians ‘Grape Escape‘ food and wine festival, which was blissful, then we’ve had a couple of visitors, including my Mum last week who came down to see Gloria Steinem (!) and help me celebrate my birthday. I’m heading off to Canberra this weekend to see my Dad and attend a conference for work. I’ve packed my woolies, and have cracked out my long sleeves and sweaters because it’s sure to be frosty. 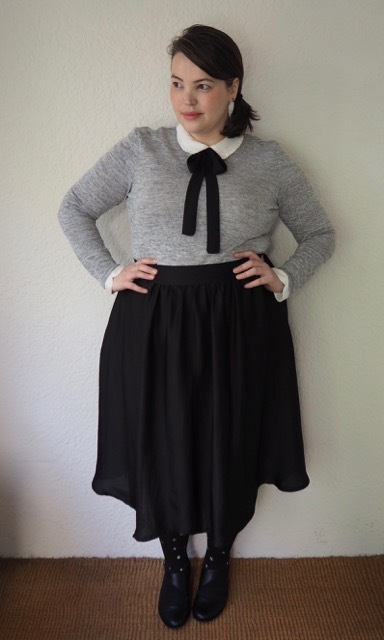 I picked up this 2-in-1 pussybow blouse from Dorothy Perkins while we were still deep in summer – it’s one of those mock layered tops that were All The Things in the early noughties, and are making a return this season. 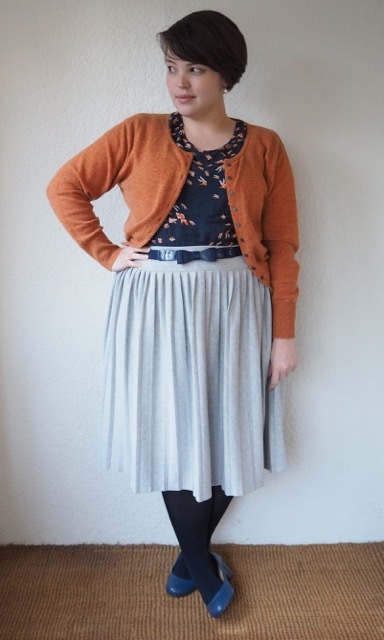 I’m pretty on board with the trend, it’s less bulky than ACTUAL layers (though considerably less warm). The pussybow ribbon comes attached, but it would be a simple thing to tie a ribbon around your collar for a similar effect. 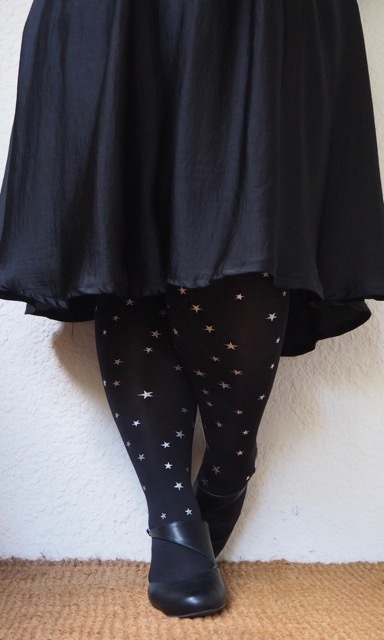 Teamed with a midi length skirt and tights it channels a bit of a schoolgirl/librarian chic – I’m hoping the starry tights keeps it from tipping into square territory. Lauren from Em Tee See has updated her offerings since last year when I bought these starry printed tights, and I quite fancy some of the new styles: there’s hearts and planets and shooting stars. I predict another order before the weather gets much colder. It’s been a really cold start to winter in Melbourne – the coldest in 65 years, apparently – and my staple range of stretchy cotton cardigans really isn’t cutting the mustard in the keeping-me-warm stakes. 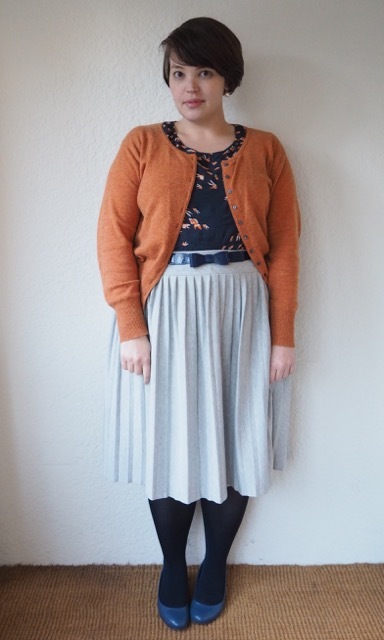 After shivering through the last days of autumn, I thought I’d take advantage of the free world-wide delivery, and multi-buy discounts at Woolovers and get a few merino/cashmere blend cardigans to wear this winter. I’m so glad I did because they’re snuggly warm and great quality for the price. I’ve been wearing this russetty-orange number for a couple of weeks now, and it’s still in great condition. 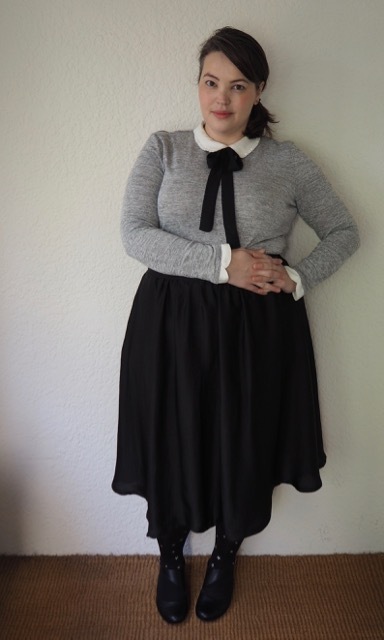 It hasn’t lost its shape, or become hilariously pilly, and while it’s not as butter-soft as my pure cashmere cardigans, it’s still soft enough to wear against the skin without feeling like I’ve been attacked by a swarm of bees. I’ve been so impressed with the range of colours that I have to tell you that they’re probably going to be my go-to shop whenever I’m looking for cardigans from now on. 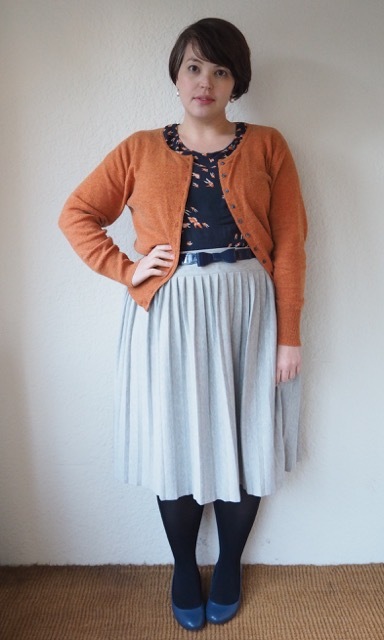 They’ve got cotton cardigans and cotton-silk blend cardigans which will be nice as the weather warms up. 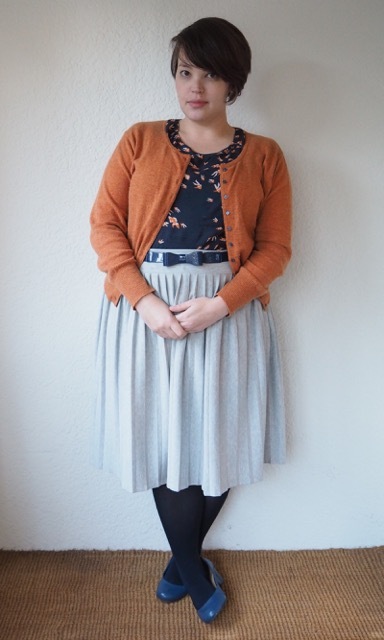 And they’ve got some pieces with stripes or polkadots too – yay! I like the way they’ve got actual measurements for width, length, and sleeve length. I bought L’s, and they fit my F-cups fine. You can shop by colour, which means that (just letting you know) there’s an entire section for mustard yellow cardigans. If you’re interested in snapping up a couple then I’ll let you know that when I placed my order with Woolovers they sent me a 10% discount offer to share with other first-time customers. Just click here for the code. 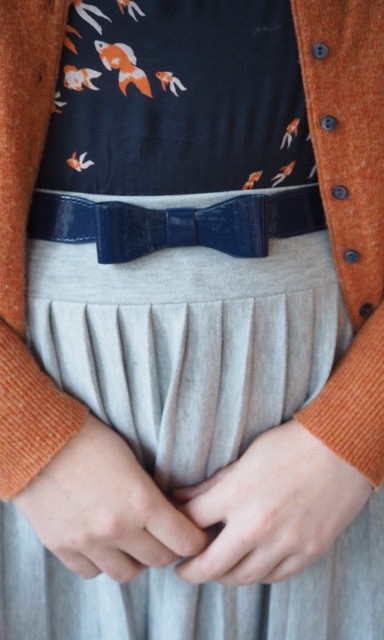 Meanwhile, in other news, I’ve discovered my dream belt! 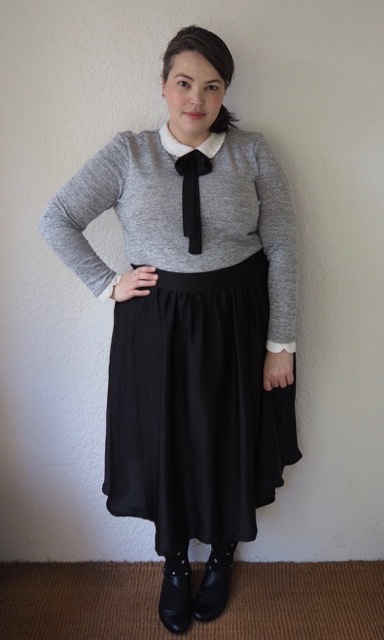 This classy little piece is from blogger Caitlin Bradley’s online shop Closet Confessions Boutique. 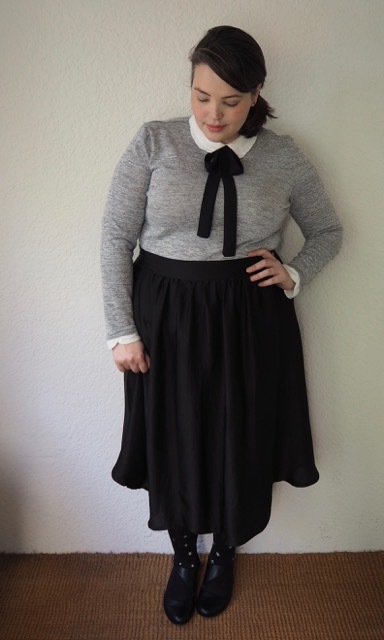 Caitlin’s started the shop towards the end of last year, and has cherry picked some really cute rockabilly-styled pieces including dresses, skirts, accessories, handbags, and these OMGCUTE bow belts that I spotted on Instagram and knew I’d have to add to my wardrobe. They’re a steal at just $12, come in six different colours, and fit up to a 50″ waist, so win-win-win as far as I’m concerned.